India stands poised to create a new role for itself on the world stage. Indians don't agree on what that role should be. It’s no easy task navigating through heavy fog in the dead of night. But on one memorable occasion in New Delhi, my driver wasn’t going to be stopped. It was 3 a.m. as we careened out of Indira Gandhi International Airport and onto the highway leading to my downtown hotel. The fog was so thick that our headlights barely illuminated the vehicles in front of us. Yet my driver kept plowing ahead, even though he wasn’t very sure where he was going. India’s foreign policy is on the same kind of path. The country is moving away from the nonalignment doctrine it followed during the Cold War, but it doesn’t know what should take its place. The contours of a new worldview are emerging, but remnants of the old one linger, reflecting an uncertainty about India’s proper role abroad that is tied to the country’s complicated situation at home. In April 1955, the Indonesian city of Bandung hosted a one-week conference for leaders from India and other Asian and African states — described by African-American writer and activist Richard Wright, who attended the event, as “the despised, the insulted, the hurt, the dispossessed” — in which they condemned the Cold War and railed against the West. The conference inspired the launch of the Non-Aligned Movement, and India, led by Prime Minister Jawaharlal Nehru, was a founding member. The bloc opposed alliances between its members and the major powers, emphasizing the pursuit of neutral and independent paths. Over the next few decades, India’s relations with the West frayed, and its economy languished — a consequence of protectionism and other inward-looking economic policies it embraced after becoming independent in 1947. It was a humiliating moment that validated a view rapidly solidifying among top government officials, most notably an Oxford-educated finance minister named Manmohan Singh: The status quo was no longer tenable. So India changed course. Singh drew up historic reforms that liberalized the economy and opened India up to the world. Economic growth, trade, and investment first inched up, then soared. By the turn of the millennium, the country’s successes had come into sharp focus: The economy was growing rapidly, civil society was flourishing, free media were expanding, and a surging information technology sector (filled with upstart firms of global reach such as Infosys, Wipro, and Tata Consultancy Services) was taking the world by storm. When most of the world’s major economies were devastated by the 2008–09 financial crisis, Indian policymakers proudly noted that India barely paused, and in 2010 its economy grew by more than nine percent, according to the World Bank. These accomplishments sent New Delhi’s branding gurus into overdrive, spawning jaunty slogans such as “Incredible India” and “India Shining.” The achievements also reinforced the long-standing sense of exceptionalism embedded in many Indian minds: Blessed with economic growth, a vibrant democracy, relative stability, and a respected image abroad, India, they believe, is destined to occupy a unique moral position in the world and to play a large role in improving it. History is one obvious source of Indian exceptionalism. The subcontinent is home to one of the world’s oldest and most accomplished civilizations. Another source is pride in India’s rich variety of traditions — nonviolent, democratic, tolerant, secular — and their coexistence within a large Hindu-majority state brimming with ethnic, religious, and linguistic diversity. This exceptionalism shows itself in what Americans often see as Indians’ tendency to view foreign affairs in moral terms. As early as the 1930s, a young Nehru — the Indian independence leader who once wrote to his father that “greatness is being thrust on me” — was imploring colonized India to look beyond its own plight and help “free the [world’s] people from the chains of imperialism and capitalism.” Decades later, when Finance Minister Singh was attempting to convince Parliament of the need for economic liberalization, he proclaimed that “no power on earth can stop an idea whose time has come,” intimating that the moment had arrived for India to become a global economic power. India’s leaders today want a stronger global voice, and they want to help establish new rules and norms for the management of world affairs. “India should aim not just at being powerful,” according to NonAlignment 2.0, a much-discussed strategic blueprint published earlier this year. “It should set new standards for what the powerful must do.” This bold statement should not be taken lightly. NonAlignment 2.0 was written by eight highly influential Indians — including the head of a major New Delhi think tank, the editor in chief of The Hindu newspaper, a former foreign secretary, and a prominent entrepreneur previously with Infosys. New Delhi covets prime spots in international institutions and at negotiating tables, and always has its eyes on the ultimate prize: a permanent seat in the United Nations Security Council. This desire to join the world’s heavyweights represents a sea change from the Cold War era, when India identified with the downtrodden. India’s approach to the major powers has also changed, at least in part. Alarmed by China’s economic successes, its close ties to Islamabad, and its growing presence in the Indian Ocean region — Chinese ports and facilities have sprung up in Pakistan, Nepal, Sri Lanka, Burma, and Bangladesh — New Delhi sometimes give the impression of wanting to side against its eastern neighbor. It is modernizing its military and strengthening its armed presence in disputed frontier areas. (India and China fought a border war in 1962.) Some Indian hawks recommend that India seize Chinese territory if Beijing encroaches on disputed lands, and urge India to increase its maritime power to forestall China’s push into the Indian Ocean region. India has a strong military. With about 1.3 million active personnel, it boasts the third-largest armed forces in the world. Land power has always been the chief source of Indian military strength — only Russia’s army has more land-based weaponry. The Indian air force is well equipped, and the government continues to strengthen it. Between 2007 and 2011, according to the Stockholm International Peace Research Institute, India was the world’s largest arms importer — and fighter aircraft constituted some of the main acquisitions. Naval power is a more complicated story. India has the world’s fifth-largest fleet, and it has demonstrated its effectiveness by staging tsunami relief operations in South Asia and humanitarian evacuations from Lebanon during the Hezbollah-Israel conflict of 2006. Though the navy is undermanned and lacks sufficient firepower and aircraft carriers to project power much beyond Indian waters, naval modernization is well under way. Not long ago, a prominent Indian security analyst told me that India and China could one day go to war over natural resources in the Bay of Bengal, off India’s eastern coast (where major new reserves of natural gas were discovered in 2002). Other observers worry about hostilities over unresolved border disputes or water supplies. Yet it’s not just the prospect of war that, for many Indians, justifies a hard line on China — it’s also the broader fear that China’s rise threatens India’s own ascent. In other quarters, India is promoting the very alliance politics it once rejected. Last year, it signed a strategic agreement with Afghanistan. In 2007, it reached a similar understanding with Japan — the two powers drawn together by mutual concern about China. Even the U.S.-India relationship has warmed considerably, as evidenced by a robust arms trade, joint military exercises, and a controversial 2008 civil nuclear accord that gave India access to nuclear fuel and technology even though it hasn’t signed the Nuclear Non-Proliferation Treaty. During the Cold War, the U.S.-India relationship was so strained that New Delhi, unhappy about Washington’s support for Pakistan and fearful that the United States was a new incarnation of colonial Britain, once signed a treaty of friendship with Moscow. The change began with the 1991 economic reforms, which impressed the American business community and prompted it to push for better bilateral relations (with a strong assist from the growing Indian-American community). Another catalyst was the end of the Cold War, which enabled the two capitals to bond over the shared goal of promoting democracy and open markets abroad. And the 9/11 attacks gave the United States and India common cause in the vigorous pursuit of effective counterterrorism policies. India has come a long way since that conference in 1955, when (in Wright’s words) “the underdogs of the human race” converged on Bandung to denounce the world order. Yet it hasn’t made a complete break with the past. In many global forums, India’s positions continue to track those of the developing world, conflicting with those of the West. In concert with the other four BRICS countries (Brazil, Russia, China, and South Africa), India has resisted the U.S. and EU positions at the Doha global trade talks and pushed back against some Western countries during UN climate negotiations. It’s also wrong to conclude that India is on a collision course with Beijing. Many Indian diplomats view China as relatively harmless. They believe that its activities in India’s neighborhood are driven more by economic and energy interests than by hegemonic impulses, and can be parried with deft diplomacy. Prime Minister Singh and others call for more trade, people-to-people exchanges, and general rapprochement with China, a stance that has prevailed in official India since Nehru’s time. As for the United States, relations have improved, but that hardly means that India will align itself with U.S. policy. 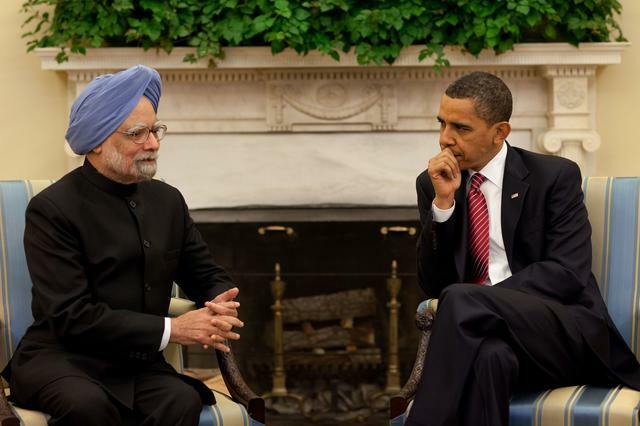 New Delhi accuses Washington of underemphasizing the bilateral relationship and failing to appreciate India’s rising power. Many Indians believe that the Obama administration cares more about improving ties with Islamabad than about taking the U.S.-India partnership to a new level. The government is also unhappy about an American law that raises U.S. visa fees for skilled foreign workers (including Indian citizens) and legislation that would punish American firms for using Indian call centers. Even the cornerstone of today’s warmer U.S.-India relationship, the civil nuclear deal, sparks hostility. The accord nearly wasn’t ratified by India’s government, thanks to opposition from anti-American leftists in the ruling coalition who were opposed to a measure that would tie their country more closely to the United States. Indian parliamentarians still have not passed the enabling legislation that U.S. energy firms believe is required if the agreement is to be put into full effect. New Delhi’s foreign policy is especially fuzzy in regard to the Middle East. In some ways, India’s diplomacy is in tune with the West’s. Relations with Israel, which before the 1990s were nonexistent, are now strong. New Delhi has declared its opposition to a nuclear-armed Iran and supported a UN resolution calling for sanctions against Syria’s brutal government. Because it fears losing access to Iranian oil as a result of U.S. sanctions, it has strengthened ties with Saudi Arabia — Singh made a rare state visit there in 2010. Yet India also refused to support the UN Security Council resolution authorizing the use of force against Libya’s Muammar al-Qaddafi and abstained from a General Assembly resolution demanding that Syrian president Bashar al-Assad step down. Elite views of Indian foreign policy are as fragmented as the policy is inchoate. Understanding this requires taking stock of India’s situation at home, where, for all the achievements, major problems remain. At least 250 million Indians live on less than a dollar a day. There are more desperately poor people in just eight of India’s 28 states than in all of sub-Saharan Africa. Four hundred million people live without electricity. Corruption and communal violence are rife, and the country is beset by dozens of insurgencies — including a low-grade Maoist rebellion extending across more than two-thirds of India’s states. Some of those with doubts about a more internationalist stance question whether India even has the credentials to become a superpower. Annual economic growth slowed to just under seven percent last year — a strong rate, but still too slow for a poor country. Inflation is rising. Whispers abound that the “growth miracle” is ending. Military modernization is imperiled by a plodding, state-owned defense industry. And India frequently finds itself in the global spotlight for the wrong reasons. The 2010 Commonwealth Games, held in New Delhi, were marred by inefficiency and graft. This summer’s mammoth power outages, which affected more than 600 million people, prompted many to wonder how a nation that can’t provide basic services can ever hope to be a global power. Superpower skepticism attracts not only left-leaning academics such as Guha, but also the political Left itself — including the influential communist parties that served in the last governing coalition and, until 2011, ruled the state of West Bengal for 34 consecutive years. However, a second group of Indians — best described as foreign-policy “realists” — says that global engagement can fuel domestic progress. “The success of India’s own internal development will depend decisively on how effectively we manage our global opportunities,” state the authors of NonAlignment 2.0. A new book by Shashi Tharoor, a prominent member of the ruling Congress Party and a former UN diplomat, calls for a “multialignment” policy in which India takes an opportunistic approach to alliances abroad, with a preference for those that help promote development back home. Predictably, some Indian elites seek a middle ground. For instance, NonAlignment 2.0 calls for continued neutrality. “Both India and the U.S. may be better served by being friends rather than allies,” its authors write. But they also underscore the imperative of global engagement and an open economic order. The eminent journalist Prem Shankar Jha took a different type of hybrid approach this summer, imploring India to “stand by” the UN’s national sovereignty principle and reject resolutions critical of the Syrian government — in effect, calling on India to leverage its newly acquired global stature to uphold the old ideals of nonalignment. Such balancing acts appeal to many Indians, but they are tough to maintain. Earlier this year, an Israeli diplomat in New Delhi was targeted in a terrorist attack likely carried out by Iran. Not wanting to upset its good relations with Tehran by acknowledging Iranian complicity, but also not wanting to imperil improved ties with Israel by denying Iranian guilt, New Delhi chose to say nothing publicly. This past summer, the Times of India revealed that a New Delhi police investigation had concluded that the Iranian Revolutionary Guard was responsible. Yet India’s government has largely kept quiet. Indian officials will not always have that luxury. Imagine if India needs to cast a vote in the UN on a U.S. punitive strike on Iran. An abstention or vote against would anger the United States and other members of the clique of powerful nations that India aspires to join. Yet a vote in favor would repudiate the noninterventionism and other principles embraced by India and ingrained in the association of nonaligned states that it helped launch. Back on that foggy New Delhi night, my intrepid driver somehow managed to find his way to my hotel. India needs to hope that its quest for a foreign-policy strategy has a similarly happy resolution, and soon. Washington has announced a “pivot” toward Asia, the Indian Ocean is fast becoming one of the world’s most important geostrategic areas, and two of the biggest story lines in world politics are unfolding in India’s neighborhood — the withdrawal of coalition forces from Afghanistan and China’s continued rise. The world is coming to India, and it will need to know where New Delhi stands. Michael Kugelman is the South Asia associate at the Wilson Center. He is the editor of India’s Contemporary Security Challenges (2011) and coeditor of The Global Farms Race: Land Grabs, Agricultural Investment, and the Scramble for Food Security (2013).